Pink to Green: Foundling Giveaway!! Today's giveaway is from one of my favorite Etsy shops called Foundling. 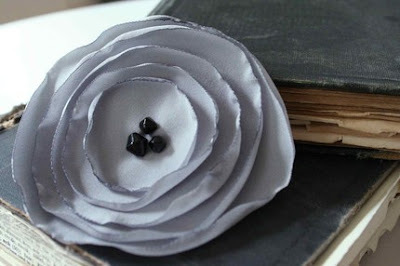 Betsy creates beautiful flower pins from recycled silk material. A set of pink poppies were my first purchase on etsy and I get compliments every time I wear them. They are super versatile; pin them to a plain t-shirt, a blazer, a black dress a la Emerson Made, I've even attached mine to a necklace to give it a new look. Today, Betsy is offering one reader the chance to win a Red Poppy Corsage! It's a large flower, about 3.5" in diameter so it will make a beautiful statement and it's the perfect color for the season! All you have to do is leave me a comment below to be eligible to win. Please answer this questions: How would you wear your pin? The winner will be announced next Wednesday, the 4th of November. Good luck! PS- Just like yesterday's giveaway, if you're a follower, you can leave two comments. Also, if you tweet, blog or post about this giveaway, let me know and I'll enter you twice!! Meg - Read your blog every day and LOVE it. I like when you give easy, affordable green tips to integrate into our daily routine. This red poppy definitely has my name on it!!! Oh my! Such beautiful pieces! I was just lurking on emersonmade's site yesterday, megan!! Would love to pin a rose on!! Particularly a plain T or blazer, so great for fall. So cute! i am obsessed with fabric flowers. I would love one. i love foundling's work!!! i would wear my pin on my lapel - i love that look! such a great accessory- I love the little pop of fabulousness it gives an outfit. I would wear my pin like you displayed it, on a strand of pearls for the Thanksgiving or Christmas Party my family is having. I think it would be a really beautiful addition to my outfit! and yay i'm a follower too! love your blog always! i love the gray poppies! Love love love it! you're number 1 follower! In an effort to accessorize more, this would be perfect! Thanks for a great give-away! What a beautiful color and piece for the holidays! I would wear it on a bag or a long cardigan!! Too cute! Oooh, I love fabric flowers. I think I would wear this pin either on a headband in my hair or maybe attached to a prominent spot on my favourite tote. i love fabric flowers! so fun to wear and really now anything Betsy makes is stinking perfecto!!! I would wear my pin on my favorite black bag. It would look stunning. This would go on my new coat--perfect for fall and Christmas! I'd put it on my black swing coat or a handbag! oh, im also a follower! I'd wear it with my petite black dress! I would love to add it to a sweet little black jacket. First, LOVE your blog - read every one! 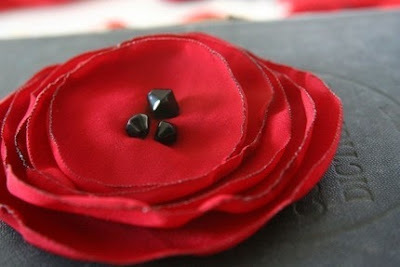 The fabric poppy flowers - I want one (or two) (holidays coming- hint, hint! )- would wear one traditionally on a jacket and as you know, I love hats - would be perfect for one of my Easter "bonnets"! I am enjoying your blog and added it to my blogroll.